Our setting out engineers are accredited with the CSCS Contracts Manger safety certificate. 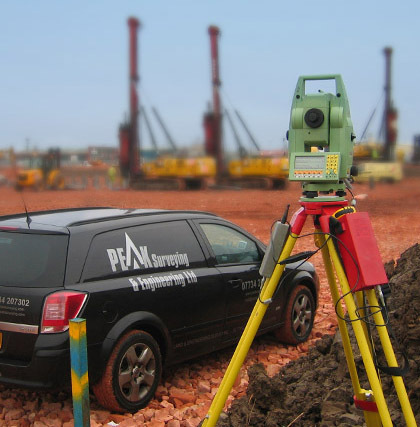 By using the latest GPS and Robotic Total Stations our engineers are able to use their experience of setting out a wide variety of structures and earthworks in an accurate and efficient manner. We come to site equipped with a laptop computer with the relevant software to enable us to exchange data in the most efficient manner, and to make changes on site where necessary without returning to the office. Our projects have ranged from setting out 20 piles for a single development to setting out thousands of piles on large commercial projects, and other projects such as roads and sewers and earthworks contracts. Our largest single setting out project to date was at Heathrow Airport Terminal 5, setting out 17’000 holding down bolts and providing engineering surveying services to two Dutch contractors. We have a number of valued clients who repeatedly use or services for all of their projects. One such client is OBY Ltd, a Cheshire based Civil Engineering contractor who has been operating since the mid 1970’s. Since 2003 we have been carrying out ALL of their Setting Out & Site Engineering duties. OBY’s main body of work is the construction of roads & sewers for large house builders such as Wimpy, Bellway, Ben Bailey etc. We have been involved with the construction of over 100 kilometers of roads and the associated drainage and infrastructure works. We continue to fulfill all of OBY’s Surveying requirements.